We took a look at all the top Florida girls that will be competing in the Championship events this weekend at New Balance Nationals Indoors. Tamari Davis has had a very strong indoor season thus far and will be focusing her efforts this year at NBIN on the 200m dash. Her indoor season best in the 200m was a 23.41 that she ran against college students at the USC Open Indoor meet back in February. She also comes in with a season best of 7.27 in the 60m. Briana Williams has yet to run indoors this season and was a late entry to the national meet after her 23.29 200m win this past weekend at the John Battle III All Star Invitational. Coach and Olympian, Ato Bolden, has mentioned that Williams is a born 60m runner and that she has had to learn to dominate the 200m. Palm Beach Gardens senior, Jacious Sears, has had an undefeated outdoor season thus far. This weekend she won the 100m and 200m at Sam Burley in two new outdoor PRs of 11.77 and 23.77. The last time she was on an indoor track was at the Under Armour South Carolina Challenge where she won the 60m dash in 7.50 and the 200m dash in 24.26. This weekend she will go after the 60m and 200m double in both championship races. Suncoast senior, Latasha Smith, ran a new PR last weekend in the 200m dash at the John Battle All Star Invitational, running a 24.50 against Briana Williams and Jan'Tajiah Ford. The last time Smith was on an indoor track was back in December, but she has been mastering her craft outdoors in both the 200m and 400m. She will enter the girls 200m Championship and 400m Emerging Elite. Dwyer junior, Holly Cassels, has had an indoor season full of pentathlon events and has been mastering her craft outdoors in preparation for the NBIN Pentathlon Championship. This outdoor season, Cassels has run a 27.08 200m, a new PR of 59.80 in the 400m, a 2:34.19 in the 800, a new PR of 15.51 in the 100m hurdles, and jumped 1.57m in the high jump, 5.23m in the long jump, and thrown 8.82 in the shot put. Oxbridge Academy senior, Hannah Kanjian, has only competed in a few meets this outdoor season and this will be one of her first breakout competitions in this 2019 season. Both ladies comes in as two of Florida's most diverse athletes entering the Pentathlon Championship. Wharton senior, Ken'naria Gadson, has had a few breakout races early this outdoor season. She recently won the 200m and 400m at the Wharton Wildcat Invitational -- running a 24.73 and 55.59 out of prelims. 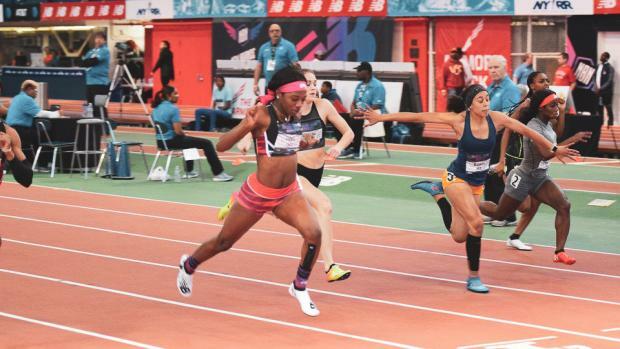 Earlier in February she clocked a 2:17.36 so we can expect a breakout 400m out of Gadson. Her indoor PR in the 400m is 55.06 that she set back in January at the Under Armour South Carolina Challenge. For her first NBIN, it will be an experience and we hope to see Gadson perform well in her first indoor meet since early January. Calvary Christian Clearwater junior, Jordyn Showers, will be taking on the jumps for Florida, representing the state in the Long Jump Championship. Showers has not competed indoors yet this season, but she has a fantastic undefeated record thus far in the outdoor season in both the long and triple jump. The junior comes in with a PR of 5.89 in the long jump and a current season best of 5.59. She also comes in with an 11.74m triple jump PR for the Triple Jump EE event. While Jordyn Showers is in the Long Jump Championship for Florida, Mycal Bowser of Fast Lane Track Club, will be taking on the the Triple Jump Championship. Bowser comes in with a current indoor season best and PR of 11.33m in the event.